Bangin' sophomore album by the 3MGs. 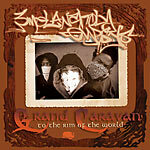 Full title is ''Grand Caravan to the Rim of the World.'' Murs, Scarub and Eligh recorded the first 3MG album of the millenium in a London (UK) studio. No guest raps on this album: it's 100% 3MGs! This quite possibly may be the best starting point in the enormous catalog of the Living Legends crew. Why, you ask? It's a straight banger. Full of memorable beats, ill flows, and unmatchable chemistry. You don't have to try too hard with this record. From front to back, this album is straight goose bump producing entertainment. There are zero guest rappers here, which keeps it focused. Murs, Scarub & Eligh have all been around since the mid-90s, and all have notably excellent solo careers. And these guys play off each other excellently. Murs has had the most popular career out of the three, bringing more of an average guy mentality to the mix, while Eligh & Scarub are a little more on the abstract tip. It makes for an exciting mix. The alluring part about this formula is that all three emcees seem to be trying to out-rap each other. All three emcees are on point, delivering flows with speed, precision and hunger. It's a true display of skill. Honestly, I've never heard Eligh rap as fierce as he does on "Halo", and I've never heard Scarub drop heat like he does on "Nautilus", and Murs is back spitting lyrics faster than he has in years. They take the time to slow things down a touch on the astrology flavored "Signs" and the lovely "And If". Eligh produces every track in the bunch, and solidifies his spot as one of the best producers in the game. Overall, if you have yet to discover the wealth of talent the Living Legends have to offer, look no further than the 3 Melancholy Gypsys. This is one crew that proves that hip-hop is not dead. Don't miss out on one of the best from the west. This is an immensely satisfying album with dope production that allows lyricism to be displayed yet still is still able to knock. Standout tracks include "Halo, The Plannit, Signs, Nautilus, Chant, Beautiful Mind, and Armegeddon." This album is definitely different and unique in its own way. These 3 members of the Living Legends definitely know how to write a true Rat style. With songs like "signs" and "Beautiful mind" its clear that the lyrics are drawn from reality situation. The bass is lacking as far as some of the beats go however they make up for it in the lyrics. Beautiful mind is a fav..... Alot of Man boys can learn from this album. This album is crazy! These guys are SO lyrically talented. Its different, Ive never heard anything like it, but its dope. If you dig Living Legends get this album.